For hours on end Mary, an elderly resident at a nursing home in Bath, lies silently in bed, her eyes closed, unresponsive, even when staff call her name. Then the lift door opens on the first floor where Mary has her room, and a ‘clip clop’ sound travels down the corridor. 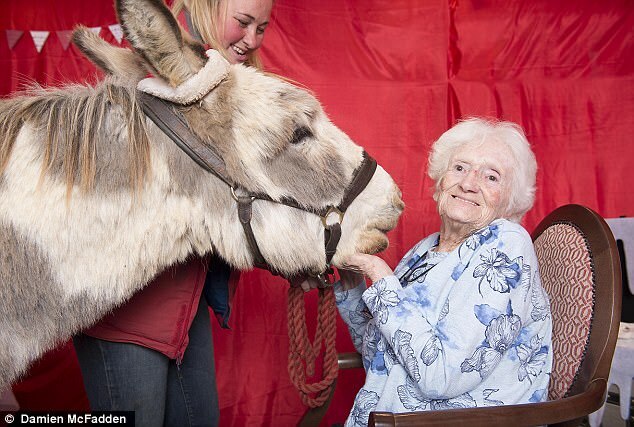 Charlie, the therapy donkey, pops his head round the door before walking confidently up to Mary’s bed. Mary’s eyes open almost instantly and, as she takes in the velvety muzzle and long grey ears, she breaks into a smile. Charlie sticks his head over the bed so that he’s within her reach, as he’s been trained to do, and Mary starts to pat his nose and neck.